Palais de Chaillot is a monumental building that is a must see when in Paris. It not only provides a beautiful view of the Eiffel Tower from the other side of the Seine River, it also houses numerous museums and a beautiful aquarium. This structure is located in Trocadéro which is in the 16th arrondissement of Paris, known for its ornate 19th century buildings, prestigious schools and large avenues. This area was named after the Battle of Trocadero. In the battle, the French army intervened on behalf of the Spanish Monarchy to fight against liberal rebels trying to capture the Isla del Trocadero. The victory brought the throne back to autocratic Spanish leader Bourbon Ferdinand VII. The Hill of Challiot was first prepared for the World’s Fair during the year 1897. The architect Gabriel Davioud created a large hall that had two wings and two towers. The structure contained Byzantine elements and was generally referred to as “Moorish.” Aristide Cavaillé-Coll built a large organ in the concert hall of the building. This was the first large organ in France and it is still in use today. The building was largely unpopular during its earlier times and the expensive cost of the construction had delayed renovations and improvements to the structure. The old palace was demolished to prepare for the Exposition Internationale of 1937. This was to make room for Palais de Challiot which sat on top of the hill. Both classic and modern elements were used by the architects who designed the structure. The designers of the new palace were Louis-Hippolyte Boileau, Jacques Carlu and Léon Azéma. There were some elements that resembled the old palace, such as the two wings shaped to form a wide arc. It was built on the foundations of the old palace. However, instead of including a central element, there is a wide esplanade in between the independent buildings. This allows room for a spectacular view of the Eiffel Tower. Today, the palace is home to a number of museums. There are two which are located in the south wing. These are the Musée de la Marine, which is a naval museum, and the Musée de l’Homme, or the Museum of Man. The maritime museum has a number of different artifacts, some of which belonged to King Louis XV. The Museum of man is known as an ethnology museum and strives to define humanity through various means. The latest museum, which opened in 2007, is called the Cité de l’architecture et du patrimoine and features architecture from the Middle Ages up until modern times. The Cinéaqua, an aquarium featuring 43 tanks of aquatic life, is also found in this place. 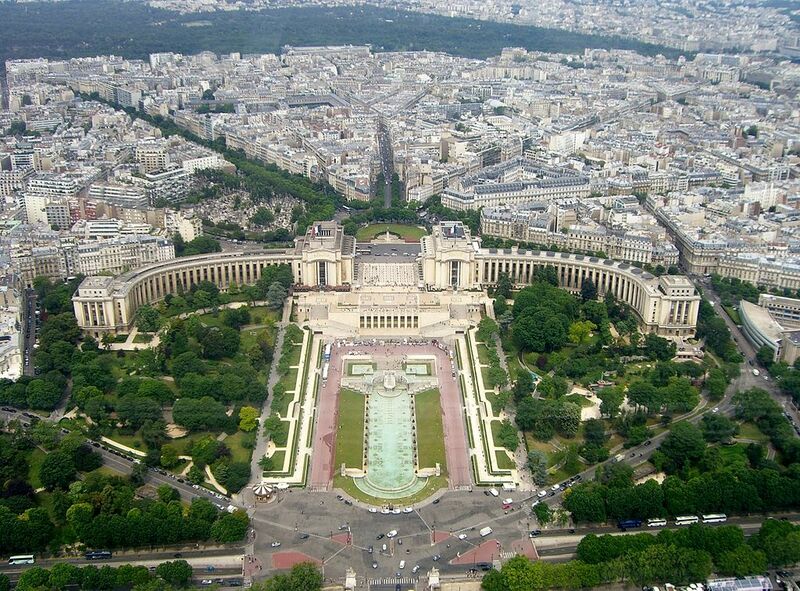 The Jardins du Trocadéro is a large 24 acre garden at the foot of the palace. This is built around a huge rectangular pond with a magnificent fountain. It is possible to view the Eiffel Tower from this garden, and it is especially beautiful at night.